Ok my dear friends! 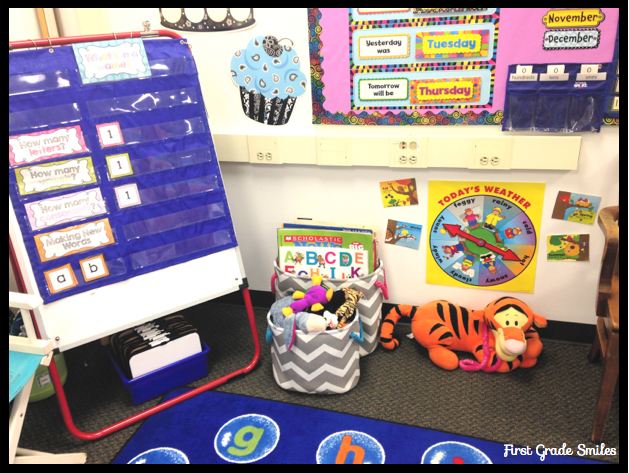 I am FINALLY sharing my classroom pictures. Oy vey! This was a long time coming. I'm not sure if I mentioned this before, but my daughter Lauren started Kindergarten this year. I teach in the same district we live in, so I'm pretty close to home (about 25 minutes or so) but it is still further away than I would like to be. Towards the end of the school year last year there was an opening in the school that is right down the street from our house, which is also the school that she would be going to. How could I NOT try to get even more time with my little girl??? So of course, I went for it. 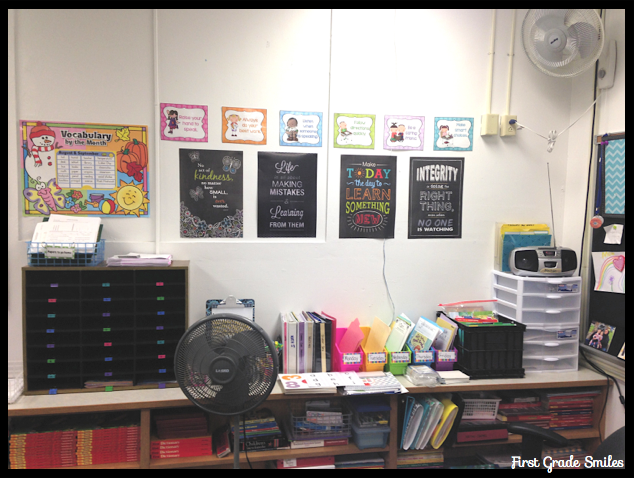 I did not switch districts, but I did change schools so that meant I had to pack up my classroom and then unpack in a new room. Always a chore, but I know I am preaching to the choir because I know you ALL know what that is like. Can you believe that I WON!!!! I was one of the 10 people who won!!!! How exciting is that?!?!? As you can imagine, I immediately jumped on the site to order some goodies. I spent that $200 faster than you can say Supercalifragilisticexpealidocious (no idea how to spell that =). There was SO much to choose from - not to mention it is super fun to spend someone else's money. Am I right? 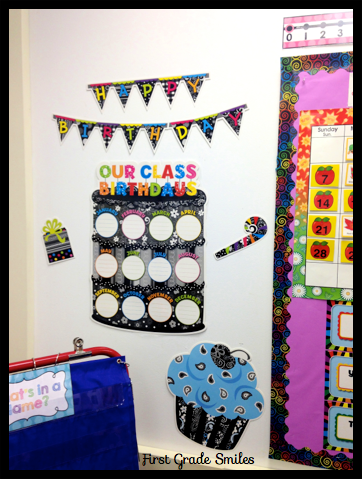 You can see a bunch of birthday goodies, stickers, pockets, bulletin board borders, days of the week set, large letters, and some awesome letter stickers (for those of us who don't have a Cameo Silhouette - these are AWESOME!!!). 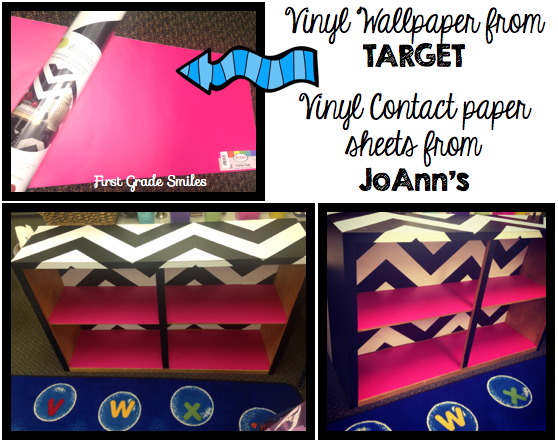 I also got a couple bulletin board sets and some classroom/learning music CD's (not pictured). They were so incredible to work with and made everything so easy! I couldn't wait to start decorating (once all my other boxes were unpacked that is). 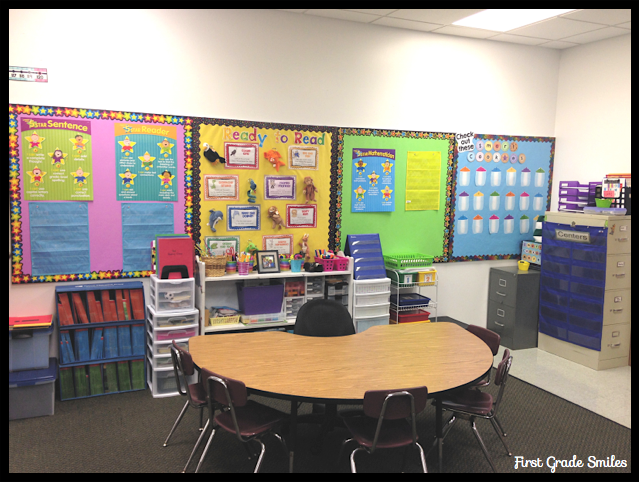 So without further ado, here is my NEW classroom! 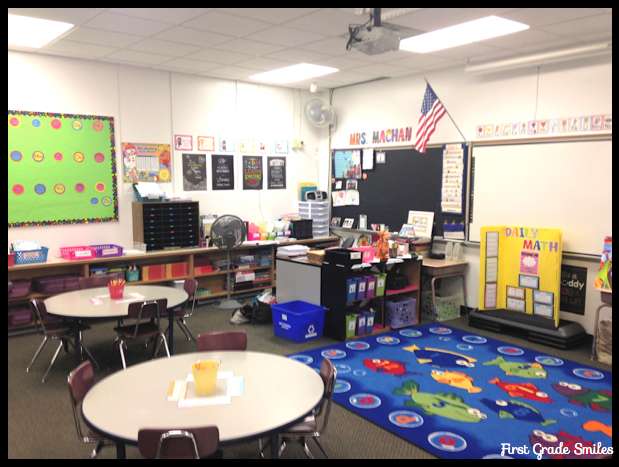 This first picture is standing in the doorway and looking towards the front of the classroom. 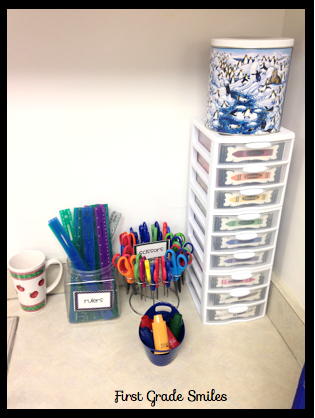 Now focusing in on certain parts...My Word Wall and student mailboxes. 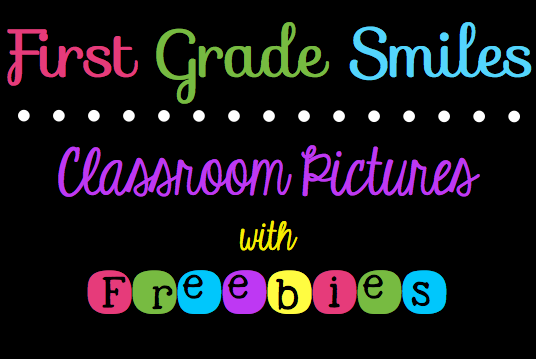 On the wall are our classroom rules and these chalkboard prints from CTP. 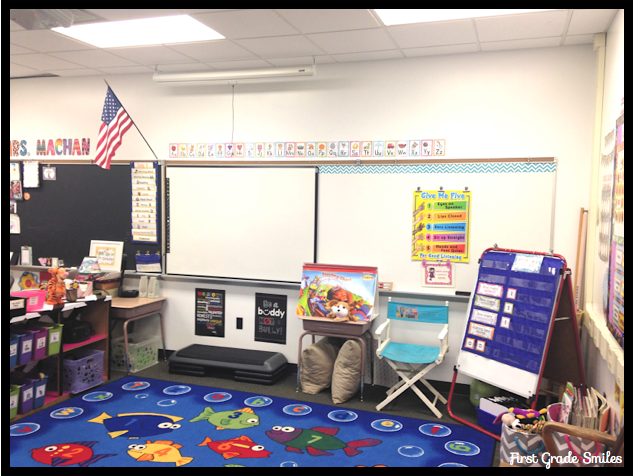 From this view you can see (kind of) the polka dot alphabet above the board, a couple more chalkboard prints under the board, and the carpet area. The shelf below sits right in front of my desk. I LOVE it ... but I didn't love it so much before. Keep scrolling to see why. Here it is --- YIKES! And here it is after my little makeover. Back to the front of the classroom. 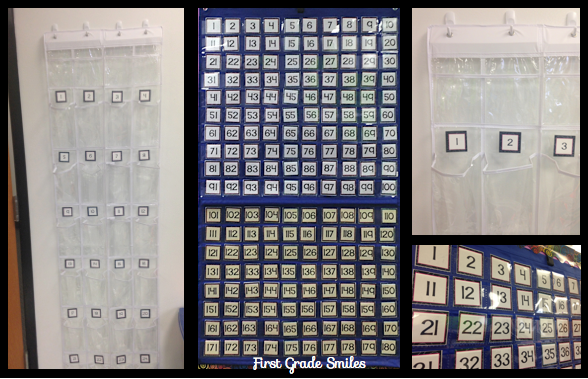 Here is my easel, which is currently set up for our What's in a Name activities. Under the easel you can see some whiteboards that I found at the Dollar Tree. They are flimsy, but they are better than nothing. 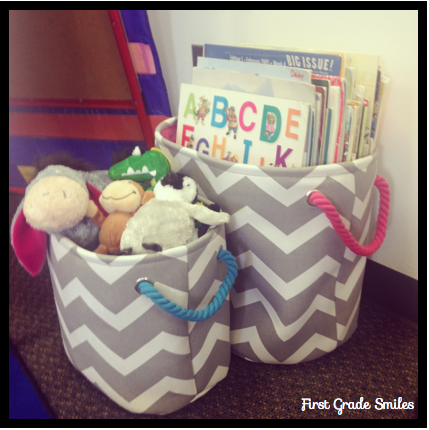 I also scored these adorable chevron bags from JoAnn's to hold our reading buddies and big books. Moving up to the wall. 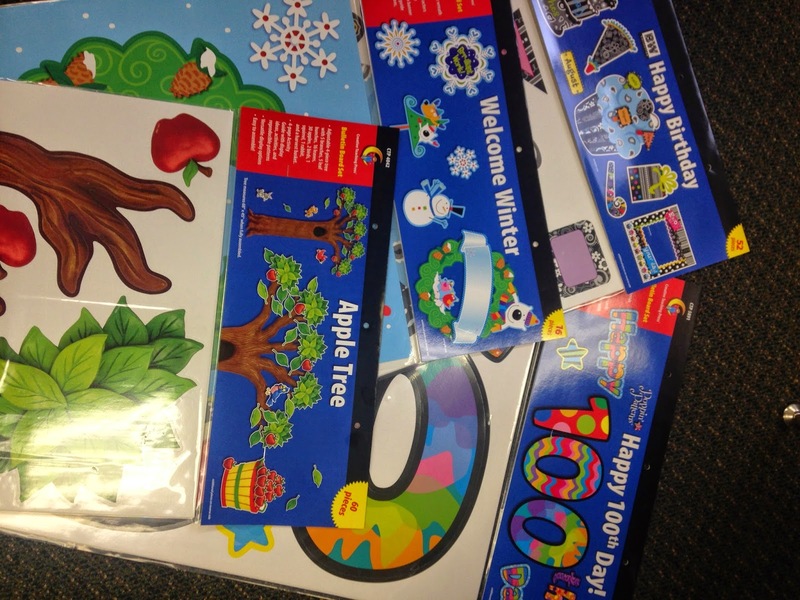 Here is part of my birthday bulletin board pack I got from CTP. 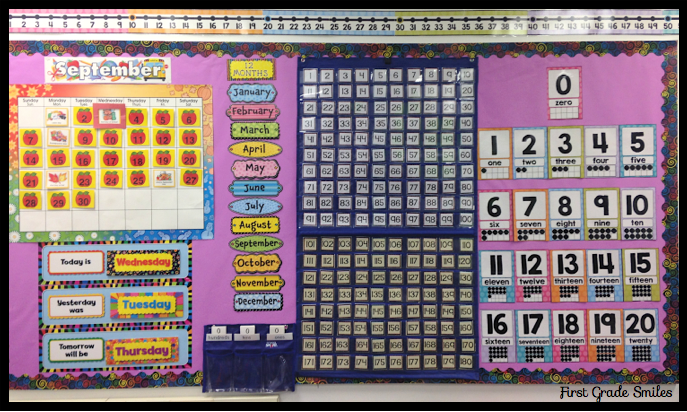 Next to that is our Morning Meeting board with calendar, days of the week from CTP, months are from their birthday pack, number chart, number line, and number posters. 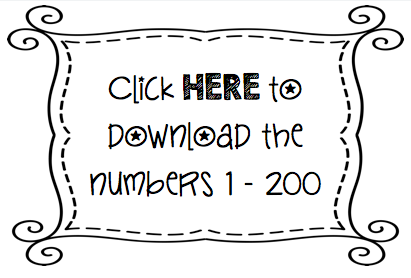 I made new numbers for my pocket chart because I needed to go past 100 and I wanted them to all look the same. I used them for this and also to label our snack pockets. You can get the number cards for FREE too! 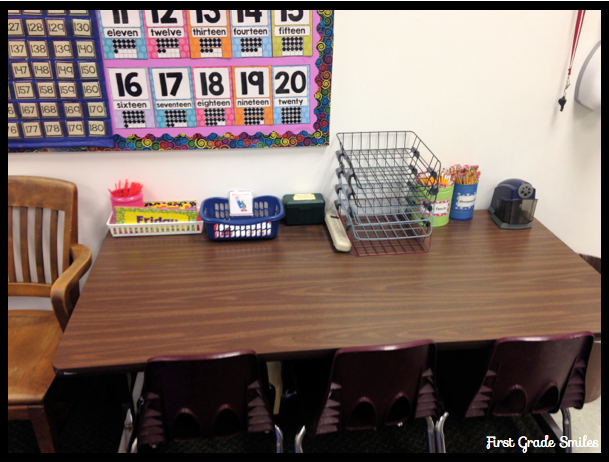 This will be our writing center and I will also store my iPads in the paper organizer. Now moving to the other side of the room. 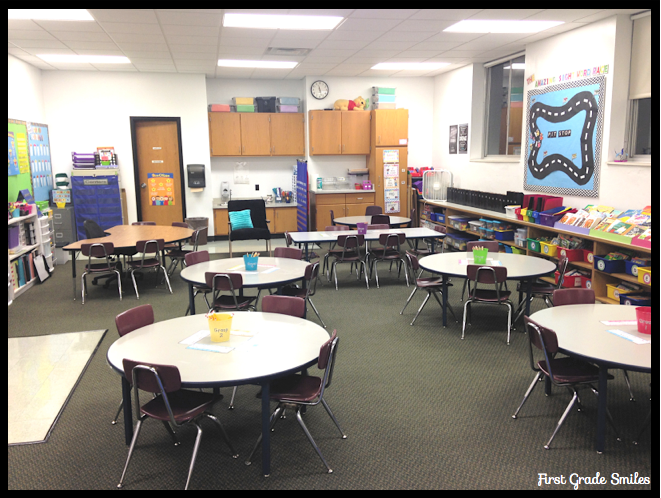 I have 22 students so I have 4 circle tables of 4 kids and then a rectangle table with 6. In the back I have one more circle table to use for a center. 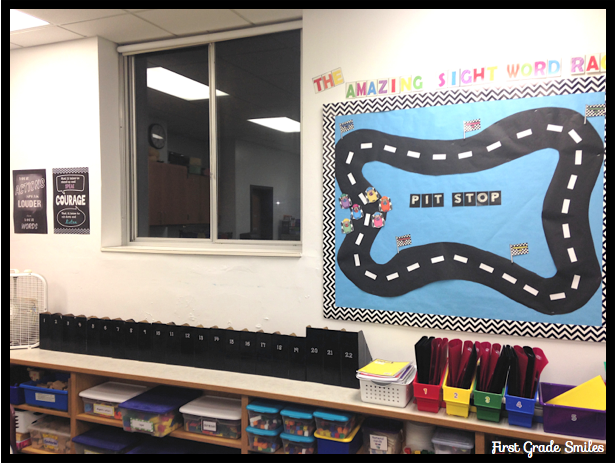 On this wall is our Amazing Sight Word Race bulletin board all revved up and ready to race! That chevron border is once again from CTP. And YES it's really dark outside - it may have been past my bedtime when I was taking these photos. 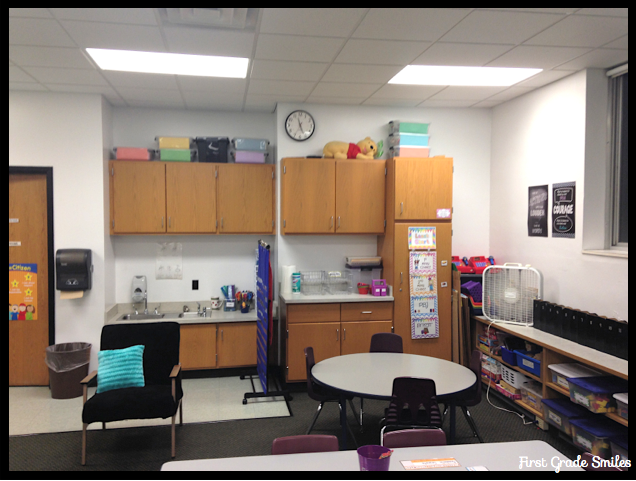 This is the back of the classroom. Nothing much to look at from this angle. This are next to the sink became a small supply center. The drawers have color labels on them (sorry I didn't get a closer picture). Any lost crayons go in here and kids can grab a color whenever they need it. 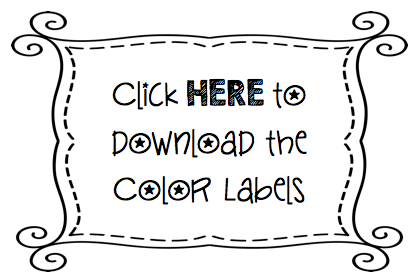 You can also get these labels for FREE. 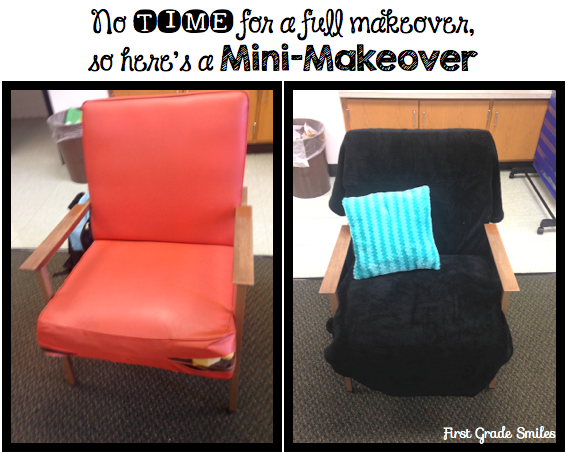 The next picture is of an orange leather chair that was in my new classroom and I did not want to get rid of it. I had big plans to recover this chair, but somehow time got away from me. Not like that ever happens, right? So instead, I grabbed a super soft blanket and fun pillow. I have since clipped and pinned the blanket a little tighter around the chair, but you get the idea. It's a little better. I plan on using this chair as a special reading chair and using it as a reward. The last part of my room is the reading table. 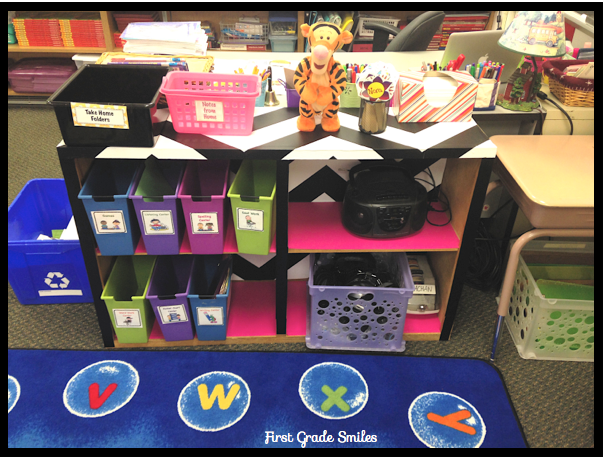 Behind the table I have all my supplies: leveled readers, centers, letter tiles, flashcards, reading pointers, SCENTOS, and much, much more! The bulletin boards all have the super fun borders from CTP. 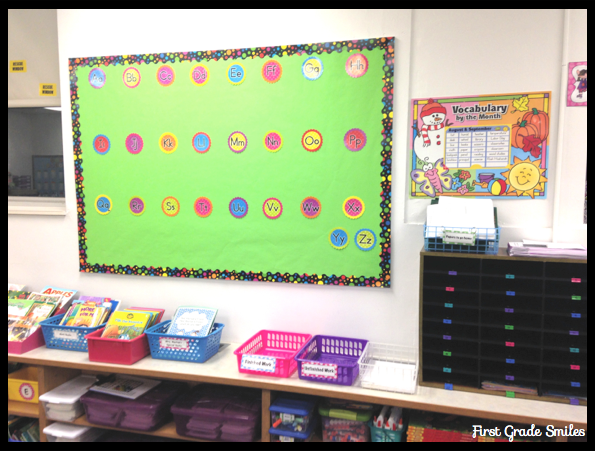 The two bulletin boards that will stay as is are my Beanie Baby reading strategies and my Smart Cookie math board from Lucky to be in First. 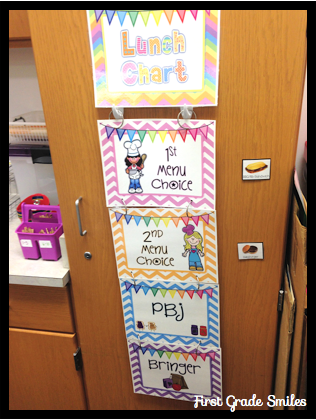 The other two will eventually hold anchor charts, but for now they have these great posters from CTP and a couple small pocket charts from Target's Dollar Spot. So I think that's about it. I hope you like it! 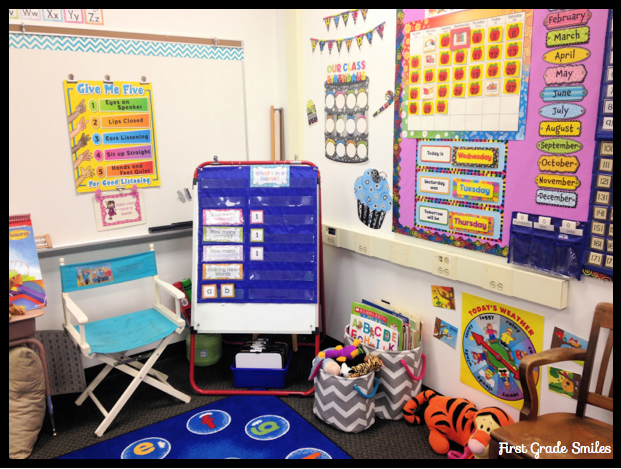 We have now started school and I am loving how much space I have this year with my 22 kiddos. 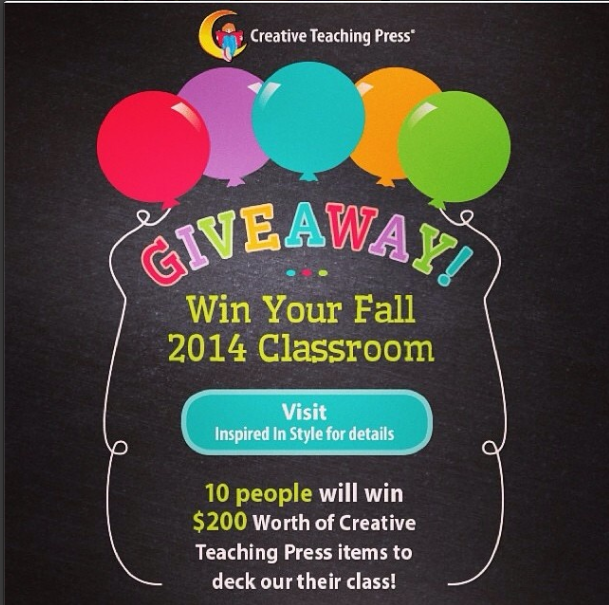 Before I go, I just wanted to share a few more goodies I got from Creative Teaching Press. 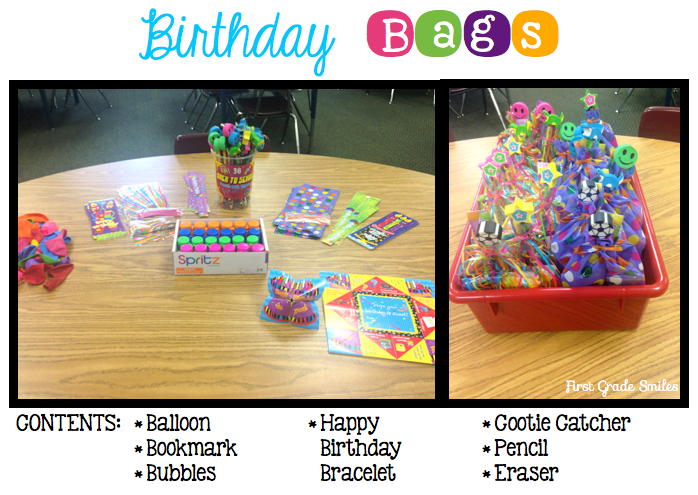 I put together these awesome Birthday Bags for my kiddos. We had our first birthday on Friday and the little boy was super excited to open his gift. The bookmarks, bracelets, and cootie catchers are from CTP. I got the bucket of pencils with erasers at BJ's and the bubbles and balloons from Target. I also will give each kid a birthday certificate and a crown to wear from CTP. Melissa! I am so excited for your big win! How fun! Have a great year friend!! 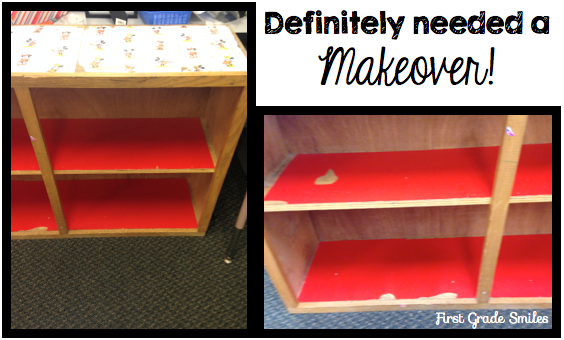 I love your shelf make-over! It looks SO good! Also loving those birthday bags. Your room looks amazing Melissa! I'm so excited that you won. You are one seriously lucky gal. Didn't you win a bunch in Vegas too? You should for sure play the lottery. ;) I miss you my friend!